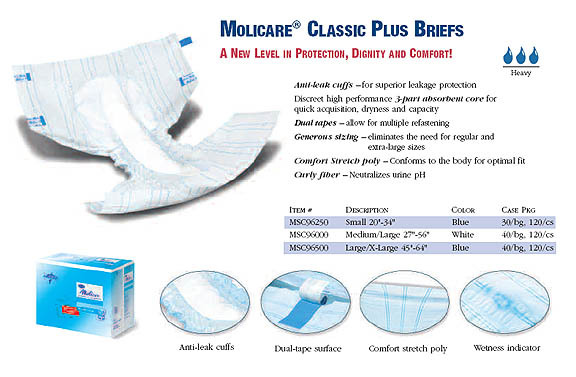 Molicare Protection Plus Briefs use an oversized design, made possible by stretch poly backing, to eliminate sizes regular and x-large. A size and tape target stripe, along with a three-part absorbent core and dual tape closure, provides for a close fit to help minimize leaks. 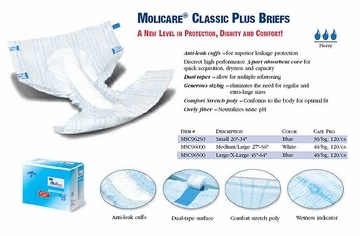 Molicare Protection Plus Briefs have a Wetness Indicator and Stretch Backing that help to Make it Fast and Easy for You.